Colmar city, Alscae, stock photography samples, by Per Karlsson, BKWine. 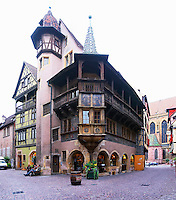 Colmar is a small city (or big town) in the heart of the Alsace wine region. It is the capital of the department Haut-Rhin and is sometimes considered as the capital of the wine district too. 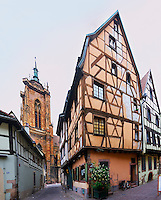 Colmar is an excellent base from which to do excursions in the vineyards to discover all the producers in Alsace. It has an old city centre with many beautiful old half-timbered houses. There is a part called Little Venice (Petite Venis) with old canals - an enchanting area for a night time stroll or to have a glass of wine in one of the cafés. It is also called the tanners' district since the canals were once used as water supply to tanneries. The city is today a very attractive tourism destination with charming hotels and many restaurants. You should not miss trying the local pizza (don't let them know we called it that!) the flammekueche - a delicious, very, very thin dough with various kinds of 'filling' on top. the French word for it is tarte flambée, but it is far from any other kind of tarte. Order one, and then when you're finished you order another and another if you want more. You should visit the Unterlinden museum with art and local history. There is a beautiful Eglise Saint Martin church, the famous Maison Pfister with carved wood sculptures, Koifhuis (old customs) and many more sights. And of course many occasions to taste the Alsatian wines.